Festool USA and Festool Canada will introduce a complete line of premium Hand Sanding products for a broad range of applications. 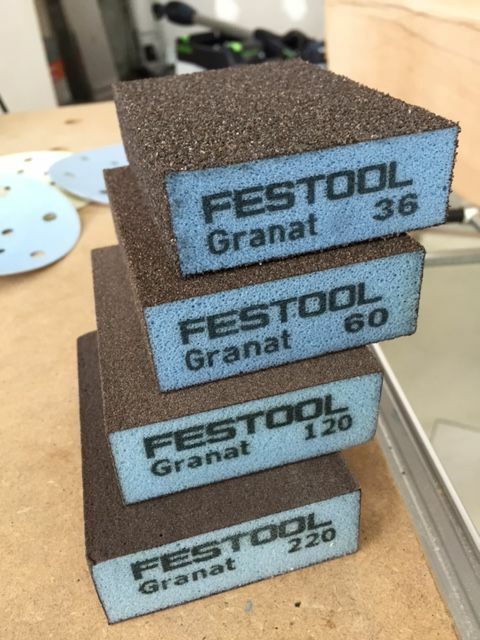 Available in sheets, blocks, sponges, rolls and pads, the premium hand sanding line from Festool was developed in accordance with the principles of machine abrasives – with enormous material removal capacity and a long service life. Festool’s new Hand Sanding line will be available in March 2017. Whether for those difficult-to-reach spots or for carrying out minor corrections – the new GRANAT premium abrasive ensures you will achieve the desired sanding results quickly and efficiently, even for hand sanding. Developed in accordance with the principles of machine abrasives – with enormous material removal capacity and a long service life. For a perfect surface, no matter the application. • Synthetic resin for entirely bonded grits delivering long lasting cutting power. • Simple cleaning enables multiple usage. • Can be simply adapted to the workpiece thanks to its flexible, extra-soft foam backing or high-quality latex paper backing. • No grooves or scratches in the surface due to a strong grit bonding. • Uniform surface quality thanks to a foam that distributes pressure. • No crinkle formation providing optimum surface protection.